A writer's journey through the land of research toward the completed destination. 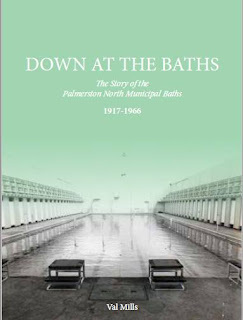 Down at the Baths by Val Mills has been awarded the Manawatu Heritage Trust's biennial award for the best local history book published between July 2015 and June 2017. This is a significant win, considering Val does not consider herslf a historian and te book is self published. This should encourage other writers that it's possible to go don the self-publishing track. Details about how to obtain a copy of the book can be found elsewhere on this page. Val Mills has done Palmerstonians, and the New Zealand historical community more widely, a valuable service in writing Down at the Baths. … Down at the Baths is a skilful exposition of the historian’s craft, drawing on extensive research into old newspapers and council records and interviews with former users. … The book locates the Baths within their wider social context, both in its rich historical account of their development and the lively stories of the people and their quirks which made the baths what they were. It is such a wonderful feeling when you receive great positive feedback about something you have created. Such is the case with my latest book published earlier this year, Down at the Baths. If you've ever had any involvement with swimming pool this book is bound to interest you. - sorry, no credit card facilities. Orders to: Val Mills, P.O. Box 1237, Palmerston North 4440, New Zealand, or downatthebaths@gmail.com including postal details. For bank deposit please e-mail for details. 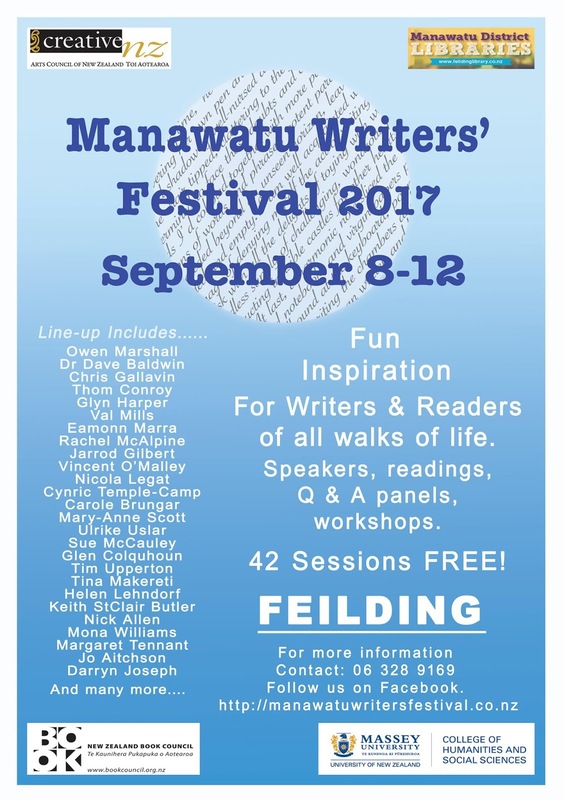 Excitement is building as the first ever Manawatu Writers' Festival approaches. Rachel Dore, the event co-ordinator, has worked hard to make this event a special one. 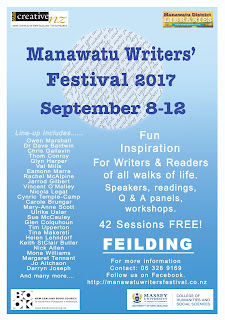 A line-up of local and national writers and publishers will present 42 sessions, all free. There is something for everyone, writers and readers at all levels of experience. During the period leading up to the launch of my book, Down at the Baths, many interesting stories started emerging, but one story in particular deserves mention. 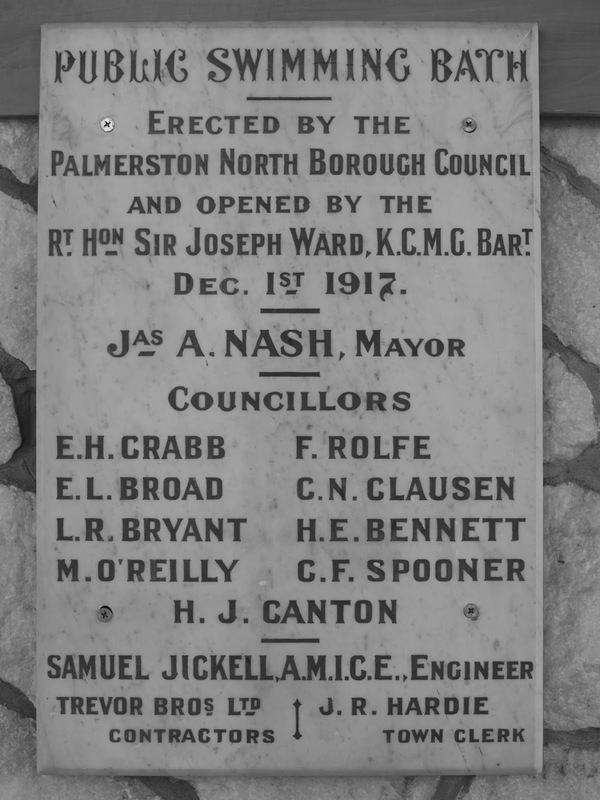 Back in 1917 when the Palmerston North Municipal Baths were constructed and opened, they were administered by Council's Baths and Lavatories Committee. The chairman of that committee was Cr H.E. Bennett, but it is another member of that group that I wish to remember today. One hundred years after the opening of the baths, local city councillor Adrian Broad made an exciting discovery. His great, great uncle, E.L. Broad, was a member of the Baths and Lavatories Committee in 1917 and his name can be seen engraved on the commemorative opening day plaque. Cr. 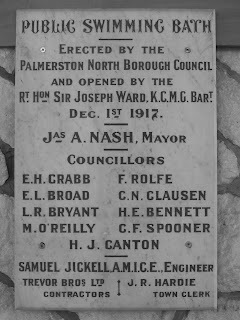 Adrian Broad must feel very proud to be able to serve the people of the Palmerston North community one hundred years after his great, great uncle was doing the same. The photo of the opening day plaque pictured here was taken by Pat Scrivens and is on display in the foyer of the Palmerston North Lido Aquatic Centre. Cold water, short summers and the lingering smell of chlorine on the skin were less important than fun and friendship while swimming outdoors in all weather down at the baths in Ashley Street. ‘Thank heavens they never went ahead with the roof,’ one swimmer said. The Palmerston North Municipal Baths opened in 1917 and served the community for nearly fifty years. Four custodians and their families called it home and so did the Palmerston North Swimming Club. It was a place for local people to swim and socialise. Val Mills regarded the Municipal Baths as her second home during the 1960s and believed the story of this local landmark should be recorded before it was forgotten. Her thorough account tells how the baths served the local community, from the perspectives of the swimming public and the Council making the decisions. Now, one hundred years since opening, it is time for the story to be told. 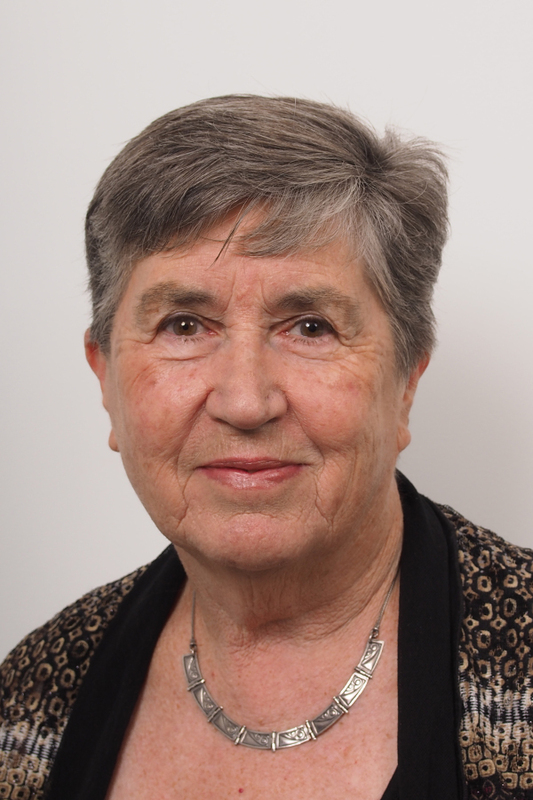 Val Mills grew up in Palmerston North, swimming for the Palmerston North Amateur Swimming Club and the Manawatu Swimming Centre in the 1960s. She and her husband returned to live in the city in 2004 and she started writing short fiction and memoir. Val has one previous publication, West End the Best End, School memories from the 1950s, published in 2012.